We buy 9 carat (9ct) gold in Leeds, Check the price calculator on our homepage to see today's 9 carat gold buying price. We buy all 9 carat Gold for the exact same prices regardless of age and origin. Many gold buyers pay less than their advertised price for Non British Hallmarked 9ct Gold. This is in our opinion and that of many of our customers unacceptable and most of them DO NOT tell you this on their websites. We guarantee to pay the prices we advertise also We Will Beat Any Genuine Cash Offers you receive for 9ct gold in the Leeds and West Yorkshire Areas. (above) Typical 9 carat (9ct) Gold, British Hallmarks. 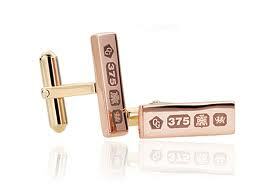 Many foreign items may just bear a "375" or a "9ct" mark. Either way the value of your gold is exactly the same.